If you want something, you just gotta go and take it. It's a philosophy that many adhere to. In general, it means that you can't just wait for things to fall into your lap. You've gotta take the initiative and work towards your goals. Thieves, however, might just take the whole saying literally and run off with your stuff. And sure, they might be able to grab more with a group of other thieves (many hands make light work, after all), but if you want to be the riches, you're gonna have to learn to not share. 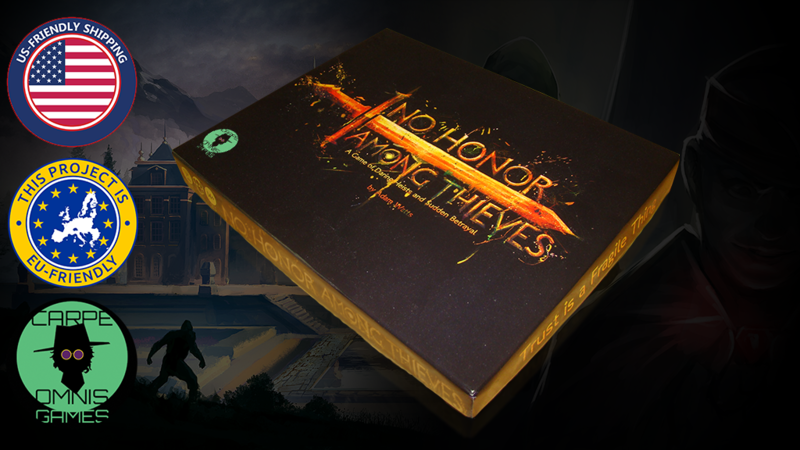 That's the story behind No Honor Among Thieves, a new card game that's up on Kickstarter. The game is sort of cooperative, but also sort of competitive. By that, I mean that there's a code of ethics that thieves follow, where they'll work together. However, being thieves, you can't always trust people to honor that code. And once the code's been broken, it's basically every thief for themselves. In the game, 3-5 players are looking to grab the most wealth from the city's elites. Only one player will be able to be the richest of all thieves. You just want to make sure that's you, forging alliances when they benefit you, and breaking them when they benefit you more.